"A venue with heart, soul and a whole lot of country." You really get the feeling of homeliness from this venue, and from it's owners. What makes the Cairn of Old Kilgobbin so unique is that it's weddings and functions are limited to daylight hours, so that guests can admire the surrounding landscapes, finding themselves between a Dargle sky and a slice of rolling lawn. Guests can hang over a wooden fence and have a conversation with one of the magnificent Friesian horses, and as the last guests drive sedately down the hillside, their resident owls can glide across a quiet farm and the tree dassies can wake up and arouse the rest of the forest night life. When you book the Cairn, they also give you two cottages, 'Gobbins' and the 'Coop' for yourself or your guests, and the entire farm is yours to explore. The garden of the old homestead is a wonderful setting for photographing special moments with loved friends and family. Just a few bends down the dusty road is the Crab Apple Chapel, who also have guest cottages tucked between their rose garden and the forest. 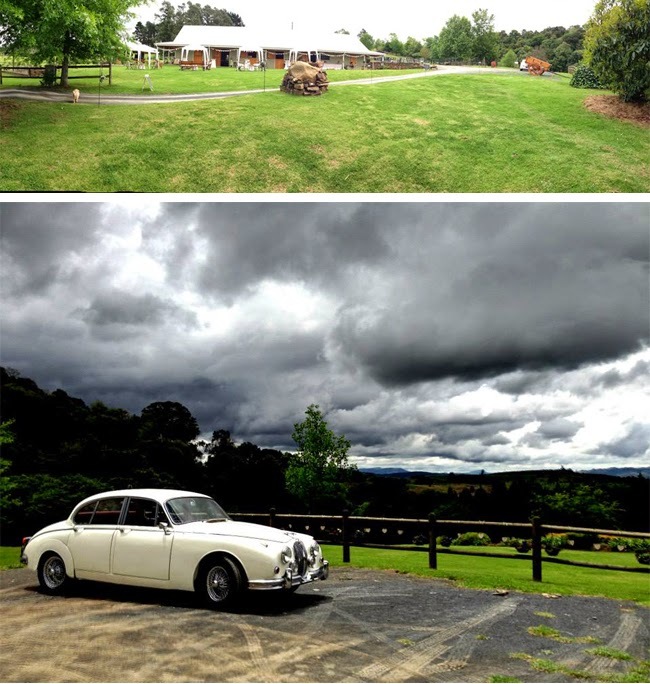 This Midlands venue is quaint, unique and comes with passionate owner Carlene, who makes it her aim to make each wedding at the Cairn of Old Kilgobbin as unique as the bride and groom themselves. Does your venue come with an indoor or outdoor chapel? - Access to the farm and the venue from the Thursday to the Sunday for all wedding activities and related staff. The gardens of the old homestead (138 year old stone house set against an indigenous forest and rolling lawns) and all parts of the farmyard may be used for wedding photographs. - Use of the Cairn for the actual wedding event, at the agreed upon times for not more than 120 people (including children...they do count especially if it rains and they can’t be accommodated outside at a picnic table), unless discussed and agreed upon by all parties. Six hours is the allocated time per wedding and a fee of R1000 per hour is applicable thereafter. The latest hour is 6pm. - Includes 2 nights (Friday and Saturday) accommodation in our 2 cottages, the Coop for 2 people and Gobbins for 6-8 people. The cottages may be used for the bridal party or for guests planning to stay overnight in the area. The barn has 4 single beds in a dorm type room for some singles! This is to the value of R7200 plus vat = R8208. 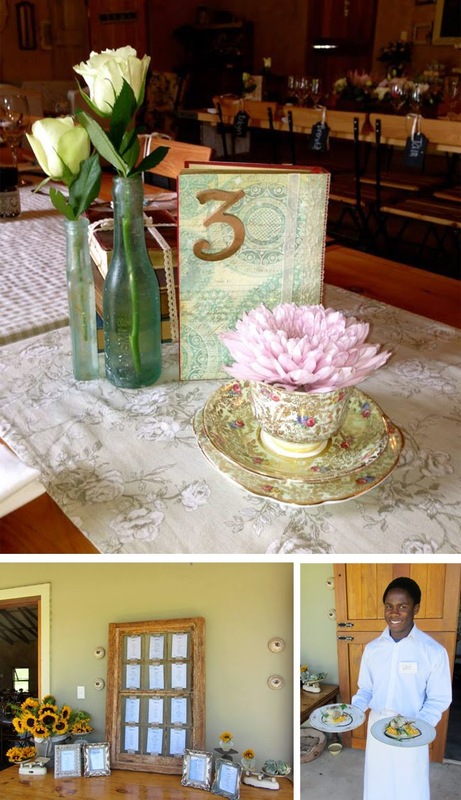 - Use of the vintage dinner services, standard cutlery, glasses and enamel ware that we own, décor pieces such as flower containers made of tin and lace, buckets, enamel jugs, milk cans etc, square hay bales and covering blankets, picnic blankets and ice buckets, ice bath, fabric bunting, old wooden dressers and tables . We have 16 wooden tables and 140 wood and iron chairs that you can use too. We can make table runners for you if we don’t have exactly what you want for a small fee. 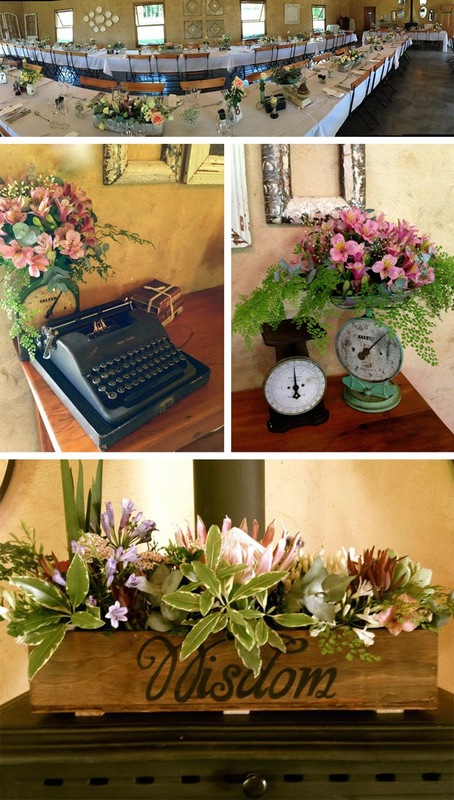 - Carl’s creative input on décor, from flower advice to country bunting, table settings to outdoor activities for your guests, and the set- up of the farmyard to enhance the ambiance of the day. - Staff to set up décor, tables and general clean up before and after, plus Karen and Carl will be your coordinators/gophers/slaves for the day of the wedding from dawn til dusk. Karen is the original creator of the NWJ Bridal Fair, is an artist and a PRO and marketing person of great creative thought. Carl is the owner of the Cairn and Old Kilgobbin, has decorated the cottages and the Cairn, and was the architect of all these buildings and their surrounds. With a Fine Arts degree and years of artistic interests under her belt, she can visualize your dreams and make them materialize, according to the budget set by yourselves. - Old Kilgobbin will undertake to have the surrounding area and buildings in the best possible condition…lawns mowed, buildings clean and beautifully decorated to create a farm atmosphere, and horses can be placed in paddocks around to enhance the farm feel. - Our sound system for background music and speeches...we have speakers in the rafters, and wireless mikes plus a stand. All you need is a playlist on an ipod, ipad or PC, plug it into our amp and so no need for a DJ. - The use of our 1965 MK2 Jaguar (Old English White with red upholstery) for getting the bride to and from the Chapel and for any photographic opportunities for the rest of the afternoon. Worth R1500 plus vat. - The bar beverages and extra barmen. We supply two barmen. We have all the glasses. We have preferred caterers, Margie from Aubergine, and Cathy from Cookalooks. Does the venue include a honeymoon suite? We have two cottages that are part of the package and one could be used as a honeymoon suite, but usually they are used by family. Our venue is unique in that we only do daylight weddings. So our closing time is 6pm and yes, we do have a fee for overtime. What kind of size wedding can be held at your venue? This venue is suitable for smaller wedding. 80 to 100 is really comfortable, but we can accommodate up to 120 if need be. What kind of bar is run at your venue? We aren't licensed so we invite folks to organize their own drinks and we supply barmen who run the bar for them. We also use a local wine merchant to supply drinks if the couples don't want to fuss with it, and the Thistle Hotel bar services are superb too. Other good things to know about this venue? Every aspect of the wedding is important to us and we put the guests at the top of the list...happy guests who feel pampered and looked after, who are never at a loose end, or hungry or thirsty. We believe relationships, friendships and conversation are the most important part of the day and we make that the focus of the day. The day is for the bridal couple to commit to each other in the presence of special friends and family, and we supply all the ingredients for a successful day. Because the barn is part of a busy farmyard, herds of friesian horses, the family dogs and the resident donkeys are all part of the beautiful surroundings and an enormous indigenous forest is the ultimate backdrop to the whole scene.